There are a few hotels right next to the beach but many more choices if you move inland or along the coast. 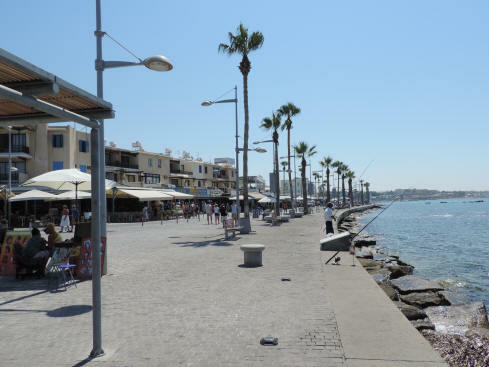 Basilica Holiday Complex Hotel - Located just a few hundred yards from the main beach in Paphos this is really right on the harbour. a classic Mediterranean resort complex with Cypriot styling. Featuring a blue tiled multiform swimming pool in the public areas and carpeted rooms inside with bathtubs and showers it is a truly modern hotel at very reasonable pricing. Almyra Paphos - This family friendly 5 star beach resort near Paphos is both stylish and relaxing. Offering modern contemporary rooms right by the sandy beach. Almyra is very relaxed, fresh and simple. There are stunning views of the sea from sea view rooms, wonderful pool in a garden area with a carefully protected pool for the children and a grown-ups only infinity pool. Amphora Hotel & Suites - A band new hotel opening in 2013 this luxury modern resort offers great views over the sea but it just minutes walk from the town center and historic sites. Inside the hotel grounds there is a restaurant, lounge bar and seasonal pool bar. Other facilities include a gym, gardens and both a full size rounded swimming pool for adults and a safe children’s pool. Constantinou Bros Asimina Suites Hotel - This 5 star luxurious resort is designed specifically for adults. Situated on a sandy beach and with two freshwater outdoor pools it is ideal for couples. Suites with private pools and wooden desk are available. Definitely a 5 star experience. Considered by many to be the perfect Cypriot wedding location.